← Does This Painting Need To Be Cleaned? James Buchanan Winn, Jr. (1905-1979), or better known as Buck Winn, was a Texas muralist, sculptor, architect, and teacher and has been said to have shaped American twentieth century art, especially in the South West. He achieved recognition in his lifetime as an artist and was commissioned to create all different kinds of art works including murals and sculptures, mostly for his home state of Texas. Despite this acknowledgement many of his original works have been lost or destroyed while many others remain in storage and away from the public eye. 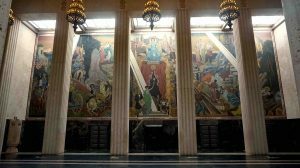 One very public and visible mural project is in the Hall of State located at Fair Park, Dallas Texas. These monumental 1936 murals were done in collaboration with other artists like Eugene Savage, Reveau Bassett, Will Smith and L. Nicholas Lyon. 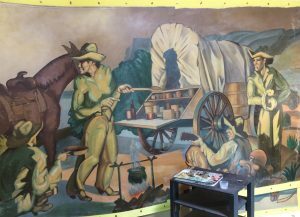 Though New Yorker Eugene Savage was commissioned to create the grand murals in the Hall of State, as related in the 2010 Hays County Historical Commission documentary, Larger than Life: The Story of Buck Winn, Savage hired Winn as his chief assistant in the creation of two murals chronicling state history. Winn also designed the hall’s large gold-leaf Texas star, surrounded by symbols of the six nations whose flags have flown over the state. To stand in front of these murals and get a good look is an awe inspiring visit. But there has only been a half hearted effort over the decades to protect these foundational works of WPA period art. They are presently afflicted by substantial surface grime, drips from water ceiling leaks, flaking and blanched paint… and previous poor quality art restoration efforts… all of which can be stabilized and brought back to their former glory. Fortunately there’s hope that the effort by the City of Dallas to privatize the administration of the fair grounds will include the restoration of the murals. In fact, FACL was hired as an art conservation consultant by the City of Dallas to review, assess, and estimate what will be needed for the long term good health of the murals. As of the date of this article, 2016, encouraging plans are going forward and the art conservation of the artwork at Fair Park is part of those plans. Another major mural restoration effort is presently in process on sections of Buck Winn’s renowned mural, The History of Ranching, a 280 foot long mural, commissioned in 1950 in San Antonio, Texas at the Pearl Brewery. At the time, it was believed to have been the longest mural in the world, keeping alive the spirit of ‘everything’s bigger in Texas’ (it actually wasn’t bigger than the Cyclorama of Gettysburg and other cycloramas like it… there were 6 or 7 painted). The brewery gave away to demolition in the interest of development and the murals were unceremoniously ripped off the walls in sections, rolled up like a rugs and stuffed into a poor quality storage situation. See the video below about their history and mural conservation efforts. Now, decades later, the mural’s importance is being rediscovered and recovered. The Texas State University chose Fine Art Conservation Laboratories after an exhaustive nationwide search for the expertise to deal with the serious preservation problems and in the hopes of ending up with a quality work of art to re-exhibit in the new Alkek Library on campus. The university owns 3 of the 11 sections that make up the 280 mural. As of the date of this article, the art conservation treatments on these 3 sections of mural are just completed. Plans to re-reveal the mural are in effect, but sadly the different parts of it have been separated… and are not likely to be reunited… so the full effect is lost. There is, however, very quiet discussions taking place regarding the other 8 sections of mural. Buck Winn focused more on architecture later in his life, designing his own home with his studio at the centre to be a hub of activity and creativity. His daughter still lives in the family home today. However it is his paintings that can be purchased through means of auction today, and remain very popular among Texan natives and American early twentieth century art enthusiasts. Buck Winn was also a teacher later in his life, teaching architecture at prominent Texan university, A&M, also Princeton University, Berkley and Rice. All of these achievements and he seems to be slowly disappearing into Texan history. Google and library searches return very little about him and the film in his honor Larger Than Life: the Buck Winn Story created by the Texas Historical Commission has gained little recognition. This is odd considering how highly regarded he is in everything written about him, how incredibly talented he was, and the fact that he is one of few artists recognized for this in his lifetime. Buck Winn completed more than fifty projects in his life mostly between 1940 and his death in 1979, all on relatively large scales apart from his award winning postage stamp design for a three cent stamp in 1946. Some of his larger works are still available to view by the public in government and public buildings, however as new development has taken place an equal number have been sadly lost forever due to bulldozing and no care taken to recover the works before hand. There are funds and awareness groups urging for protection of these art pieces such as the Texas State Historical Association, stating that they are important works to preserve for the sake of art history and Texan history. Some of the murals no longer even exist in photograph form which is a real shame for future generations as well as all that appreciate his art work today. It is unclear why more care was not taken during reconstruction. This story demonstrates the necessity for the preservation of architectural art (like murals) and also that loss of something precious can still happen in an “enlightened society” as ours if no one takes action to “make it happen.”. Losses and gaps such as the one in Buck Winn’s repertoire demonstrate a modern example of the problems we experience in looking at history. It is a difficult task to interpret the past as is, and the further you get from it and the more gaps that present the more difficult it gets. Especially in an age of technology and knowledge, as we are now, there is no real excuse for the loss or forgetfulness of anything like this. Luckily, there are several societies and organizations fighting to save and promote Buck Winn’s legacy. These include the Texas Historical Commission and the Texas State Historical Association, which is one of the only bodies to have a decent biography about the man in question. Hopefully he will continue to be recognized for the artist and innovator that he was, that no further works of his will be forgotten or destroyed and thanks to experts like Fine Art Conservation Laboratories for their expert consultation service, nationwide on such projects and for their heroic efforts to do the actual mural protection, preservation and art restoration. This entry was posted in Murals and tagged Buck Winn, Mural conservation, mural restoration, Texas. Bookmark the permalink. I love western art and your article was great. Thanks for your work on preserving this important work by a major artist. I can see by your other blog posts that you have done major projects in Texas for a long time. We are lucky to have you! Love what you wrote about this subject. Very interesting. Thanks Jayme! Yes, I’ll keep ’em comin’… lol. I always spend my half an hour to check on and to read your website’s content everyday along with a mug of coffee. More articles please! I love your subject, your profession and your vibe. Its strange how an artist who has done so much for the community and has done so much major work in public, was so connected and had such a great reputation can later be forgotten and disrespected with a major mural as this. A big thanks for Texas for your work on saving our heritage! Wow, that’s quite a story. These are the types of interesting details you never get in a classroom! Interesting post. I love western art and this was very interesting. Very cool info as I love cowboy subjects in art. 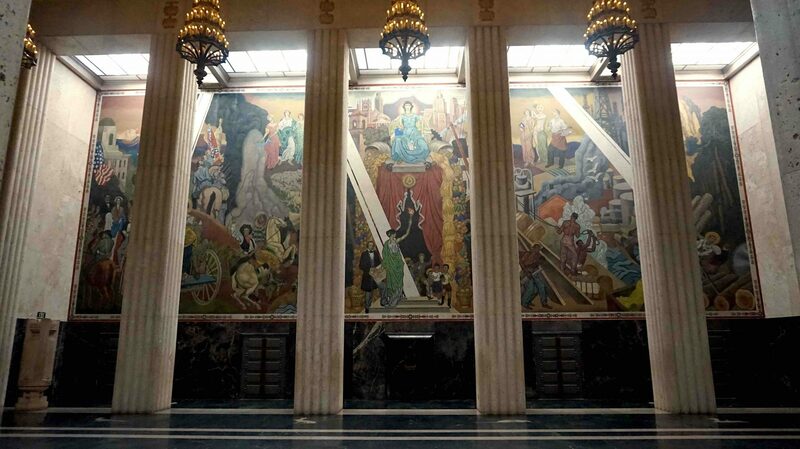 These historical murals are definitely worth saving. Eventhough the artist isn’t heard of much, its articles and projects like this that get him known. Thanks for sharing. Really great work! Sorry, I’ve never seen any. Its a very satisfying profession Leo. As I’ve learned more about Buck Winn and his mural work I’ve been very impressed and give him great respect. Thank you for this great article. One of my favorite artists to read and learn about. Good work! What would the process be if a large mural like this was in a building that had to be torn down? My guess is that would happen quite a bit, but how do you move such a piece? I would really like to see some photos of the home that Buck Winn built. I have not been having much luck searching online for them. This article allowed me to learn a lot more about Winn’s art. I appreciate that. I also took some time to search online for his stuff. What a great thing to be restoring and preserving these pieces! I wish that I lived in an area where restoring art was important to people. I think its an old school thing and for the younger generation, it does not seem to be of the same importance. What do you think? What percentage of art restoration do you think is handled the wrong way, due to corruption or whatever? I would like to read more about restored arts. do you have a news resource that I could use to find this information? It seems to me that you have a very rich love and knowledge for restoring art. That is a great talent and you should know that it takes a certain personality to want to restore something you do not not own, for everyone’s enjoyment. I think its a good move also, if handled correctly. Scott, this is a great thing. Since you mentioned a lot of the murals have been destroyed, keeping those that are left in top notch shape is very important to this time in history. Thank you for this great article. 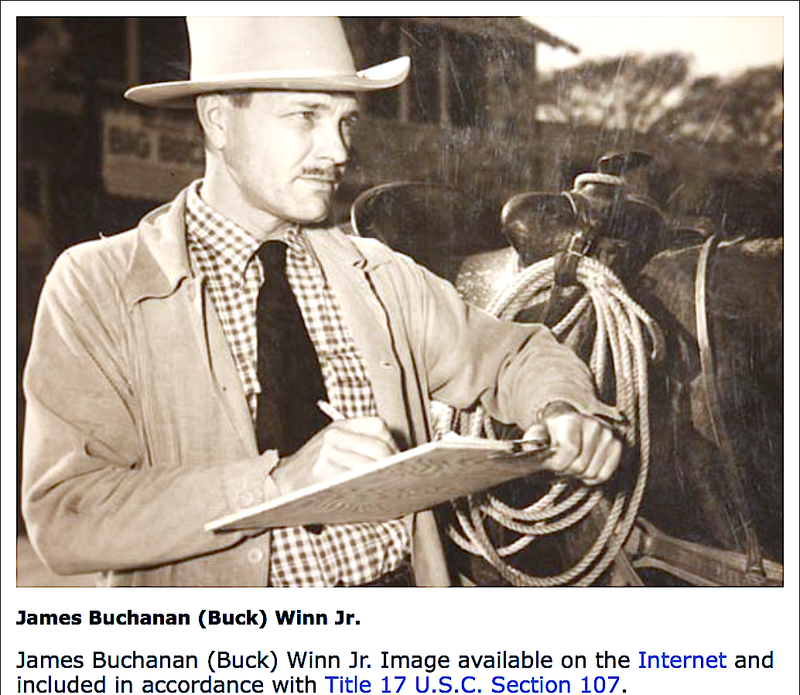 I have read a lot about Buck Winn while studying at Rhode Island School of Design. It was nice getting your take on the projects. I love watching the YouTube videos showing the restoration of the art work. What a great talent that is! If being able to preserve these awesome murals means privatizing the fairground admin, I am all for it. That is a swift move that will keep history alive longer! Thanks for your kind words Nancy! Thanks Karen for your enthusiasm. Stay connected with our blog! There are lots of headlines about neglected world treasures. But its usually mishandling of funds and corruption that is to blame, even though there is widespread interest to get the work done. Andrea, absolutely, it takes people who are interested to make noise and make sure the community knows what they have. Thanks Richard. Yes, the mural was 280 ft long but we only had 90 ft of it on this project. We are waiting now to see if we will get another 60 ft to work on. Thanks for the comment Dennis. Unfortunately many of Winn’s murals have been destroyed because of demolition. It will take more people doing historical articles and videos placing him in a historical context and recognizing the part he has played in creating Texas’ artistic heritage. I often wonder why people like Buck Winn are not talked about more when it comes to things like this. You mention in the video about him that he does not get much recognition, but why? That bothers me. What a great soul and his murals are just fantastic. Wow! A mural that is over 250 feet and you have to restore and preserve it? That seems like a lot of work, however as I read through this website, I see that your technique is a good one! Keep up the good work so that art lives on! Do you think that if those organizations that want to preserve Buck Winn’s treasures were not around, the murals would just go to waste? Restoring art is a very lost art itself. There are so many great art pieces around the world that are getting exposed to elements and possibly going to waste. This service is great. Thank you for this great article. The Winn collection is one of a kind as you said and should live on for as long as humanly possible. Thank you again! I watched the video and really like how the FACL was commissioned for this project! As I read through your website, I am astonished at how well you can preserve something that was created many, many years ago! The time it must take and the knowledge to bring something back to life, or give it longer life must be limitless. Good work! It looks to me that Buch Winn was a great artist and gives plenty of reasons to make sure his art lives on. Great article!